This diary has been in the possession of my family since it was sent home to Harrys mother (my great grandmother) after his death in 1918. My mother gave it to me over ten years ago. The original is now with the Infantry Museum, Singleton. I decided to transcribe it as I believe that it is a valuable historical record of a year in the life of a soldier during World War One. I have also transcribed it to honour his memory. I dedicate this transcription to my mother, Beth Porteous. Troopship Runic embarked at 6.15 a.m. put out into mid-stream at 9 a.m. had dinner was paid one pound and afterwards went on deck. Mother and Rose with Doris was out in the launch to see me weigh anchor at 20 min to 4 oclock. Cleared the heads at 4 p.m. Last of dear old Manly for a while. Alls well everything O.K. Steaming south passing Bondi, Coogee and other bays, Wollongong seen after. Porpoises and albatrosses also sea birds of every description. Nearing Bermagui Passage light house. Sea birds, also a steamer bound north. Cleared NSW coast passing green cape late in the afternoon Victorian coast sighted. Lost sight of the Victorian coast during the day games were played, bottle thrown over. Just in sight of Wilson Prom. Entering Bass Strait. Steamer on its way to Port Phillip Melbourne. Still in Bass Strait steaming towards the great Aust. Bight. Lost sight of the coast. Hello whats up something gone wrong below stearing (sic) gear out of order. Everything O.K. again in sight of land. In sight of land western coast of Australia. Steaming towards Fremantle on starboard side, Rottnest Island this island was used in the olden days as a prison for convicts. Pilot came out to take us in to the harbour on our way in we passed the breakwaters which form the entrance to the harbour this was between 7 and 8 a.m. at 9 oclock found us along side the wharf at 10 oclock leave was given to go ashore for 2 hours. Went to the Post Office and sent a telegra.m. and posted letters home. Left the Post Office and caught the train for Perth. At 10.15 arrived at Perth at 10.45. Went to Pears the jewellers. Had the rings fixed up then to Sharps for some cigars etc. And around to Hay St for some postcards. Left Perth by the 11.30 train and arriving at the boat at about 12.15 in good time to get the boys their dinner. Sorry to say the most of them were in a sorry state and had to leave it. Well I washed up and cleared away. Left Fremantle at 2.30 in the meanwhile a batch of reinforcements from Black Boy Hill all of them fine and well made chaps. So it was just like leaving Sydney for every body came down to see them off. I felt a bit sad. Perth and Fremantle are not bad after all. No sight of land a few flying fishes sea calm. Steaming WNW for Colombo sea calm. Still WNW Seen one or two porpoises a very pretty sunset. Still on the way to Colombo. Very calm. Target practice. Target practice firing at boxes (unknown word) Sea calm seen the first sea bird since left Fremantle. Calm sea boat sighted from our boat going south. A log sighted the old skipper thought it great excitement was a sub steared (sic) in a zigzag course. Still no land in sight. Sea calm crossed the line. Sighted a sailing boat too far away to say where it was going. Sighted land in the distance. Dhows and catamarans coming out to our ship. Ceylon in sight. Adamson Peak. Most perfect sunrise I ever saw. The sun was just coming up behind two peaks. Island of palms. Entered Colombo Harbour. Native boats and lighters coming out to load our ship with coal. A few natives came on board with curios. Bought some coins. Went ashore in lighters for a route march passing through some fine streets and native villages. Well the finest of all was the native oxen and carts on our to the Barracks we passed the hospital which is not far from the lake. Well we are now in the barracks after a rest and a few drinks. Marched back to the lighters. While on our way I bought a box of cigars for 1/6. Back to the ship again. Went for swim in the harbour. Several ships came in. Left Colombo between 4-5 in the evening. Last of Colombo was at 7 oclock p.m.
Sea calm. The most southerly part of India. Name I could not find out. Fine sunset. Raining at midnight. Ship sighted on the skyline. WNW Pay day between 1-4 in afternoon. Bought two tins of tobacco. 4oz. each 2/-. Raining all day, sea getting rough. Church service. Steamer in sight about 4 miles off. Great excitement. First steamer seen since we left Colombo. Inclined to be stormy. Sea choppy. Rainbow in the morning, dull all day. Very pretty sunrise. Cloudy, fine in the afternoon. Sea choppy. Sea choppy, island of Sarcottra (unknown word), British passed in the morning, in the afternoon steamer sighted. Sea moderate, warm day, in the afternoon cloudy. Sailing boat sighted. Passed Aden 9 p.m. Arabian coast. Arabian coast this morning, Island of Persia Light house. Red sea passed steamer going to Egypt and one NZ transport going south, six other steamers also going south. South African coast passing the twelve apostles light house on the starboard side. Steamers passed going south and north, island with light house. Sea calm. Church service in the morning. Passed steamer in the distance. African coast. Calm sea. Sea calm, steamers going south. Islands and light house passed. Kit bags and inspection. Steamers in the distance not known owing to haze. Port Suez. Anchored just outside the canal. Warships guarding the entrance, thought we were to land here but orders came to proceed to Alexandria. Troop ship came in from Alexandria. Fine views from our ship with the glasses, (unknown word), camp and sand cliff in formation of mountains. Troop ship left this morning bound for the Persian Gulf. French steamer came. First sight of white people since we left Colombo. Other troop ships, hospital ships and others. One hospital ship left this morning bound south. Left port Suez at five oclock in the evening possibly to the Suez canal. Suez Canal passing through the Betten Lakes at midnight, British camp passed just as the day was breaking with the sentries giving a cheer as we steamed by. Later on we came in sight of the railway and dredges native craft in the Man O War containing a hydro plane also a camel train. Entered Port Said, a refugee camp, hospital ships, French warships and other steamers. Boiling during the day so the C.O. gave us a route march through Port Said and out to de Lesseps statue. Founder of the canal. Had dinner then marched back to the ship. On our way back had a talk with some (unknown word). On board again. Had tea. After we gave the sisters of the hospital ship Nevasa a sing song finishing up by giving them a good hearty cheer which they gave in return. Left Port Said bound for Alexandria at 5.30 p.m.
Alexandria 9 a.m. Passing a fair number of hospital ships in harbour which I suppose had done some good in the Gallipoli Campaign. We came alongside at 12.00. During our final stay on board there was a fire on board a German Prize Steamer. It was a fine sight to see. I heard later it was bound for Salloutte Disembarked at 12.00 oclock midnight for Cairo. Goodbye S.S. Runic Taking it from the start to the finish it was an ideal start. After leaving Alexandria we arrived at Cairo railway then on Zietoum where we marched to our camp which was two miles from Zietoum and one mile from Heliopolis. First day was bit hard. We had bully beef and bread. The next day it was stew for breakfast, same for dinner, but for tea we had tinned fruit, eggs etc. Every night leave was granted on Saturday and Sunday went to the zoo and pyramids, Cairo, Zietoum and other places. Monday route march through Zietoum along the Eng fields etc. Escorts to the barracks taking prisoners taking them to their respective camps. Route march to Kasseunil Barracks to do piquet guards. Kasseunil Barracks doing piquet duty for six nights at Opera Square. Hours were until 11 p.m.
Pyramids for a walk then over to a native cemetery where I had a look at it then across the sand dunes for about two miles where I found some shells. These I found on the Lyberian desert and also some coins about 1950 years old. They date back to the reign of the Caesars. Pay day was on the 16th inst. Our piquet was given some Sphinx cats by a native. Doing escorts and fatigues etc. Firing party for a funeral for a comrade from 19th Battalion the poor chap was buried with so many others in Old Cairo. Orders for departure for the front leaving about 0435 for Alexandria on the 27th inst. Out in the stream. Breakfast at 7 oclock. Steaming out of Alexandria Harbour at about 8 a.m. Seen the last of Alexandria was between 8 and 9 a.m. Mine sweepers sighted on the port side, first day out. Life belts were ordered and had to be worn for the remainder of the voyage on account of submarines. Boat drill also had to be carried out. Seen a destroyer and a troopship to the port side. Sea calm. Sunsets are very pretty. Lovely sunrise this morning. Land sighted believed to be the Algerian coast. This coast is very mountainous. Here and there snow could be seen. Minesweepers, minelayer. Later on we were in sight of the Tripoli coast not the Algerian coast. Some excitement, night alarm given. Glorious morning. Seen a French destroyer escorting two steamers bound south. Also a British destroyer steaming the same way as us. Boat drill etc. Fine morning. Sea choppy. At Malta at &.30 a.m. Here we saw some fine buildings and harbour. Mine sweepers and two submarines were seen in the harbour. We left Malta at 10 oclock. Passed a hospital ship on its way to Malta. Later on in the day had a tooth pulled out. Boat drill etc. Heavy swell. Islands of Sardinia, Corsica. Later on passed a Mediterranean passenger steamer, boat drill etc. French coast 5.30 a.m. Right on until we reached Marseille Harbour about 10 a.m. Along at 11 a.m. Very pretty mountains. Scenery. Left HMT Saxiona 6 oclock for a rest camp 11/2 miles from the wharf. Arrived home at 8 p.m.. Camped here for the night. Still on our way through France passing by French farms and villages. Still on our way to Etaples. When nearing Etaples we passed British and French Soldiers. Etaples. Arrived here about 9 a.m. Marched to the O.S. where rifles were issued and then to our camp. Very cold. Very cold here. Route march to Touquet-Paris Pleirqs and back passing along some fine avenues then on to the sea shore where we had a spell. English Channel. Some parts remind me of England. Route march to Bull Ring. Bayonet fighting etc. Out to the Bull Ring instructions on how to through (sic) bombs and trench work etc. Church Parade. Rest all day. Tidied up the tent, washed a few odds and ends. Seen two airships passing over Etaples. Parade to Rifle Range. Rifle practice in the afternoon. I look for Chats. Cold night. Raining all day. No parade. I had a bath parade instead. Very pretty sunset - night here very cold. Route march to Paris Plaige. Was caught in a rain storm on the way back. Went to bed early. Dull and cold. Company went to the Bull Ring. I myself stayed in my tent all day with a bad cold. Wrote letters etc. Route march to the Bull Ring. Company drill etc. Lecture on marching in difficult parts of northern France. In the afternoon called out on a review by some French officers. Church Parade. After parade down tents for the rest of the day for an airing. Route march to the Bull Ring. Instructions on how to throw bombs, hand grenades and the use of gas helmets and masks etc. Raining in the afternoon. Route march through the camp and along a very pretty road. Passing by some fine fields and woods. Coming back by a little church in a French village. 8k from camp. Bull Ring. Instructions on how to build trenches by filling sand bags etc. Gas helmets. Shifted camp. Hailstorm this morning. Parade in the rain disturbed on account of the rain. Fixed up the tent. Parade in the afternoon. Fine afternoon. Company on duty. Rec two letters. One from Bill and one from Ada. Fine day cloudy night inclined to be raining. No parade today. Raining. Went to Etaples. Bought post cards. Had tea with a Tommy at a French fishermans place. Afterwards went bach to camp. Easter Sunday went to Church Parade in the morning. After dinner down tents a lovely spring day. Company on duty. Nice day rather cold towards evening. Aeroplane seen flying over Etaples in a WSW direction. ANZAC Day Ceremonial service in the morning. Sports in the afternoon. Between the hours of 12.25 and 2.00 a.m. on 26th a Zeppelin came over and dropped something like a dozen bombs near our camp. Damage not known two bombs fell in a wood near the NZ camp. I went over and found a piece of shell. Route march through some fine country we passed on our way out and on our way back. Bull Ring instructions on French work etc. Nice and warm all day. Nice fine day. Pay day. Sent parcel home from s 17 Post Office. Very easy day. Church Parade in the morning. Had a rest in the afternoon. Very nice and warm. Bull Ring for parade but did not go. Saw a squad of Cherry Pickers (Lancers)passing by our camp. A British aeroplane and one in the afternoon. Heavy storm passed over our camp between five and six oclock. Very cold during the night. Parade to the Bull Ring. Raining on and off all day, rather stormy, posted papers home. Company on duty, nothing doing all day. Aeroplane passed over our camp this afternoon. A bit on the cool side all day. Route march this morning through some fine fields. After dinner lecture on bombs, grenades by our OC McDowell. Inspection of rifles. Bull Ring for drill and got three days CB for not shaving. Bugger them. Fine day and warm. Route march through and around a little French village and back through fine fields. Tobacco and cigarettes were given out. Received tobacco from home. Raining this afternoon. Church Parade this morning. Raining the best part of the day. Inclined to clear up. Sent some papers and letters home. No parade during the day as it was raining to (sic) hard. At 6 oclock went to the Bull Ring for night operations. Parade to the Bull Ring. Bayonet Drill, lectures. Route march passing through some fine fields of barley, daisies. Back to camp. Parade to the Bull Ring. Bayonet drill etc. Washing parade. Pay Day. Very easy day. Raining all day. Aeroplanes flying over camp. Company on duty for piquet in Etaples from 4.30 p.m. till 12.00 p.m. midnight. Raining all day. Parade to the Bull Ring. Did not go out. Stayed in camp. Raining all day. Parade. Marched to Bull Ring. Inst. rapid loading, bayonet drill and company drill. Nice and warm all day. Parade to the Bull ring this morning but did not go on account of going to the dentist to have plate fixed. Seen airship flying over Torquet paus Plage. Fine afternoon, nice and warm. Inspection this morning. Inspected by Sir Douglas (unknown word). Bath parade in the afternoon. Nice and warm all day. Parade to the Bull Ring. Did not go out owing to having strained my knee. Went to the Drs. To have it painted. Went to the Drs. this morning to have my knee painted. Had a very easy day. Nice and warm. Its getting well towards summer here now. Reinforcements for the 1st Division arrived here this afternoon. Church Parade and service. Rec. two letters from home. One from mother and Rose. Very warm here now. Wrote a letter to mother. Parade to Bull Ring. Instructions: Bayonet drill, Company drill and extended order. Rec a letter from home Bill Brown this afternoon. Lovely fine day nice and warm. Inclined to rain tonight. Coy on fatigue. Sgt Marshallday had to clean up to otherwise it was a very easy day although. Was very warm during the day but it looks as if there was to be a storm. Aeroplane passed over the camp this morning. Went to a sing song at the (unknown word) . Was very pleasing. Wrote a letter to Bill Brown. Parade to Bull Ring but did not go out. Was charged by Sgt Major before the Major for being absent from parade. Got 7 days C.B. Dull all day. Inclined to rain. Empire day sports on Saturday 27th. Route march this morning through some fine country fields with red topped lucerne and buttercups and poppies. Raining this morning. After dinner went out again for another march, had rest, came back to camp, started to rain. Parade to Bull Ring. Instructions i.e. : Bayonet, gas helmet, sandbag filling during the day. 5 aeroplanes were manoeuvring off the camp. A very pretty sight. Nice and warm all day. Cool towards night. Tents down for airing. Alls well. Pay Day. Rec a letter from Doris. Fix up a track for the sports this afternoon. Aeroplanes were over us again, few airships over Paris plarqe. Lovely fine day. Church Parade this morning. Airship and aeroplane seen today. Wrote a letter to my wife. Grand day nice and warm. Coy on parade in the morning in the afternoon parade at the Bull Ring. Raining most part of the day. Parade to the Bull Ring. Inst. i.e. : gas helmets, bayonet drill etc. Raining this morning. Fine in the afternoon. Draft for Battalion. Transferred to 19th Btn. Etaples 5a.m. Stopped at Boulogne 8 a.m., Calais 9.15, Saint-Omer 10.15 a.m. 12.00 Hazebrouck Boillical 12.45 arrived at Steinwourk somewhere between 1 and 2 on my way to the front line. Some shells bursting some at a (unknown word) was awakened early by our own side. Giving the Germans a few shells. Things quiet this morning. Snipers are very playful. Seen the Germans line about (unknown word). During the afternoon the Germans bombarded the 7th Btn line. It was awful first like Hell (unknown word). Met Bill and Eric. Germans at it again. Shells everywhere. British guns reply. Bombarded again this morning. Fritz up to putty. One shell hit our parapet. Did not burst. Gave us a bit of shaken up. During the afternoon a Fritz sniper nearly got me. Relieved by the 17th Btn. In our billet canteen (unknown word) went Streaky (unknown word) Bacon to Bill and Eric and talked of old times. Our fatigues to and from the trenches. Well for a bath to (unknown word) this place used to be at one time a dye works and other things too numerous to mention. Pay Day drew off during the week. Spent most of my time with Bill. Met some of the old mates etc. Fatigues - working in the trenches at night carrying and building parapets. Went down to see Bill each day. Had talks of past, present and future times. On Sat 17th went to the trenches. Arrived 11 p.m. on Sunday nothing doing. Monday night a little strafing to place on our right and left. A little strafing going on. Nothing doing. So far everything quite well. From 20th to 27th there has been some very heavy bombardments on our right , left and front to which Fritz suffered heavily with observation balloons. He lost three by our aircraft. The last two days its been wet. Mud and slush everywhere. Things a bit quiet today. Still dull at times raining. Relieved from trenches by 14th Btn. To our Brigade spell. Went to supports, waited there for the 14th Btn. Our guard relieved at 11 p.m. left supports for Fort Rouipin. Arrived at Fort Rouipin at 3a.m. tired out: during the day I rested. Parade this morning. Inspection of kit and rifles. Parade in afternoon. Fort Rouipin is a fine place. Our billets are situated in a fine old orchard with a canal flowing. Everything beautiful here. Our fatigue tonight. Read some Manly Dailys. Adas birthday announcement of her 21st birthday God bless her. Parade in the afternoon. Bayonet drill, gas helmet instructions etc. during the rest of afternoon was spent purchasing shirts etc. from canteen. Went out with Bill. Had a good time. Issue of tobacco etc. It is a day of rest (unknown word) Sunday. Went for a walk with Bill along the canal. Talked of times we had together. Beautiful day. Parade for two hours this morning and two hrs this afternoon. Went for a swim after tea. Bill and I went for a walk. Talked of times tec. Beautiful day. Nice and warm. Parade morning and afternoon. In the afternoon instructions on bomb throwing tec. Wet all day. Parade this morning, fatigue in the afternoon. Loading transport waggons with load metal. Road very bad, raining all day. Rec letter from Arthur Withington . Parade, morning and afternoon. Very dull all day. Likely to rain. Rec. letters from home. Fatigue all day. Raining best part of day. Nothing doing. Parade morning. Went to (unknown word) for change of clothes and a bath. Pack up left for fort Rouipin. 9 a.m. on route by Steinwourk Strazelle covering 16 miles on reaching Pardelles farm house, stayed for the night. Left Pardelles 10 a.m. this morning via Hazelbrook along St Omen Rd to a farm house. Across the railway line at 4 p.m.. Tired out. Glad to have a rest. Left Wezbeure passing Calais, Boulogne, Etaples other places too many to name arriving at Saliaux. Passing close to (unknown word) on our way to Piquirary 12 oclock. Had dinner, rest for the afternoon. During the evening went for a walk around. Visiting the old ruins of the Chateau de Piquirary built AD 946 also church and old grain mill. Having a good time here. All well. Parade this morning went for a route march this afternoon. On our way out passed fields of wheat mingled with sunflowers and poppies then by some fine woods then through the village of (unknown word) and back to our billets. Parade this morning down by the river Somme. In the afternoon went for a swim in a pond by the river Somme. This was covered in parts with water lilies. Very pretty. Church Parade this morning. At 12 noon pack up left Piqurary 12.30 arriving at a small village north of Armiens about 4.30 covering a distance of 11 to 12 miles - tired out. Parade in afternoon. Piquet during the night. Left Coisy at 1 p.m. for Herissart via Pirruqott . Arrived at Harissant - 4.30 p.m..
Pay day - nothing doing. Left Herissart 10.30 A.M. Arrived at (unknown word) between 1 and 2 passing through some fine country. Went for a route march. Parade in the morning. Orders to move off at (unknown word) Arrived outside Albert 10 p.m.. Awful bombardment going on. Dawn - waiting to move off. Bombardment still going on. Manoeuvring in the morning. Order to the firing about 5.30 p.m..
(unknown word) to the firing line last night and all day today, Some very fine German dugouts here, had a narrow shave today. Shells bursting everywhere. Front line - heavy shell fire during the morning and a great number of our boys were hit. In the afternoon I was buried, gassed and hit with a piece of shell. Taken to dressing station and then to the clearance station. Stayed here for the night. At clearance station to be dressed again. Taken to the train bound for Boulogne and then to the Canadian hospital No. 3 General. In Canadian hospital. Everything O.K. doing well here. Day warm doing well. (unknown word) for some. Sharp pains now and again. Sunday nice and warm. Had the band playing this afternoon and evening. Some fine selections were given. This is the first band I heard for months. Getting on well. Getting on well now. Hope to be out very soon. Day very warm, alls well. 2nd anniversary of the war. Still in hospital, doing well, day very warm. Sent letter home and one to Bill. Going to convalescent camp. Doing very well nice and warm. Hospital getting ready to move to convalescent camp Bouloque. Left hospital at 2 p.m. Arrived convalescent 3 p.m. seated all afternoon. Had tea, went for stroll. Convalescent Camp. Went to the Dr. Had wound redressed. Went for a walk to the sea. Went to Boulogne for a walk, had a good look around. Bought safety razor etc. then back to camp. Discharged from Con. Camp. Sunday went to Marlborough Details camp. After dinner to Boulogne and the beach. It was grand to be on the sea shore once more. After that went along the pier and watched the troopships come in also hospital boats. Grand views. Deatils Camp. Went for a ride in the motor to Boulogne stores where difficult fatigues took place. During the afternoon went for a walk to the monument of Napoleon. View taken from here is grand. Can see Blighty. Gen. fatigue to St Martins Camp. Spent the day there. Afterwards went back to camp then to Boulogne for a walk during the evening. We are having lovely weather here. Put up a few tents today. Nothing doing, after that had a good rest. Lovely and warm. Went for a walk to Boulogne. From Marlborough Camp to Etaples to rejoin unit. 9.30 A.M. left the camp. Arrived at Etaples at 12.30 then to 2nd A.D.B.D. to rejoin unit. Rested the remainder of the day. Weather warm. Met some of the Manly boys here. Short parade this morning. Issued with tobacco this afternoon. Issued with tobacco this afternoon. Very hot and muggy all day. Sunday. Order to move off postponed till Monday. Rested all day, warm. Met Bill Brown tonight. waiting for orders to move off. Had a talk with bill. Bid him Au Revoir. Left Etaples 3.30 bound for Pousiville. Arrived at Pousiville in the afternoon. Tuesday 1st time went to rest camp. Rest camp ordered to move to our Battalion but was taken ill and sent to Val de Maison Hospital suffering from influenza and gas poisoning. Met Sid Payne today. Still dull, inclined to rain. Still at Val de Maison. Still the same, not feeling too good. Wet and cold all day. Still in the hospital at Val de Maison feeling just the same. Sid Payne left for the battalion. Still dull. Left Val de Maison for rest camp to rejoin the unit. Sunday. Still at rest camp. Cold and inclined to rain. Went to the Drs. this morning found out I had bronchitis and was sent down to the CCS4 here waiting for train to No 13 General Hospital Boulogne. Admitted this morning. Had a bath etc. its grand here right on the beach. Examined by Dr. Sent to England. St Dennis. Left Boulogne 6.30 arriving at Dover 8.30. Left by train 9.00 p.m.. Dover Castle on the right. The trip across the channel was glorious. Arriving at Gravesend 11 oclock there in a taxi to the Aux. Hospital Milton Barracks. Went to a tea party given by the Bowlers of Gravesend at the Bat and Ball club rooms where different games took place. Had tea at 4 p.m., the band played us down and rendered some fine selections throughout the afternoon followed by a concert. I spent a most enjoyable afternoon. The people here seem as if they cannot do enough for you. Went to town to do some shopping. Bought a pipe etc. and some postcards. Met an old pal (unknown word) place today at the post office. Had a walk down to the Thames and back, band played this afternoon. Went for a walk to the Thames in the evening to a concert given by the Suffolk Reg. Very pleasant indeed. Went for a walk to the Thames and back, spent the evening reading etc. Stayed in all day. Spent time reading etc. Went for a trip to Southend. On sea this outing was given by the tug masters of Gravesend. Spent a most enjoyable day. Spent the day indoors. Raining all day. Spent the day indoors reading etc. Went for a walk to the prom. Raining. Raining all day. Spent the day reading etc. In hospital. Could not go out on account of taking ill again. Yesterday went to pictures. Went for a walk to the prom. went to the pictures this afternoon. Left hospital for Chatham. arriving at 12.30. Left for Victoria Station at 2.50 Victoria Station. Went to Housfary Road Headquarters. Stayed at the A.I.F. Club for the night. Left via Waterloo Station for Luggarshall for No.1 Camp Downs. Sunday. Rested all day, waiting for furlough. Waiting for furlough papers and pay. Pay, Paper and ticket for furlough. Left by the 9.45 for Waterloo. After11.00 before we arrived. Stayed in London till 9 oclock prior to meeting a chum whom I met while in hospital. Both went home for tea then left for St Pancreas Station due back at 9.30 p.m. for St Boswells arriving here about 6.30 Saturday. Met Mrs Hall and family. Rested all day. I visited several places of interest on Monday night Flo and I went to the station to catch the train which left at 11.06 p.m. Bid Flo goodbye and left for St Pancreas Station London arriving here 8.30 Tuesday morning. Had breakfast then went for a tube ride arriving waterloo in time for 11.20 train for Luggarshall arriving here about 11.30 p.m. Classed and sent to No. 2 Coy. No.1 Command Depot Perham Downs from there that is 3rd inst till now Ive been in camp here. The camp. Raining all day so of the boys. Went away this morning. Sent letter home to mother. Rec. one from Flo. Still in camp during this period. Went into Luggershall with chum Rec. letter from (unknown word) and a chum which I met in hospital. Also met a chum from the 19th Battalion, Frank Long. In camp nothing doing beyond its very cold and wet. Went away from camp to (unknown word) Spent a few days there during the time snow fell for two days. Left Thursday afternoon 23rd for Perham Downs. Arrived here 6.30 same evening. Had tea, went to bed. Classified again B1A3. Rested all day waited for draft to Whauham hope it does not come off. In camp. Fatigue this morning. Quite a home here. Nice room with electric light etc. Wifes anniversary. Xmas Day, had a good time. Very cold and snowing. Received cards from friends in Scotland, England. Had a good time New Years Eve. Stayed out till 1 oclock in the morning. Felt very tired. Had a bad head - nuff said. Nothing doing, snowing and raining. Private Harry Broun was wounded in action in France on 3rd October 1918 and died of his wounds on the 4th October 1918. He is buried in Tincourt New British Cemetery, East of Peronne in France. He was 25 years old. Station on 4.10.18 from Gun Shot Wound left shoulder, penetrating back. shown in the records as wife. Pte. 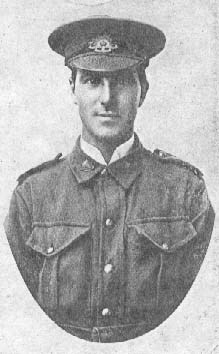 H. G. Broun who died at the C. C. S. on the 4th Octr. consciousness and passed away very peacefully at 8.10 a.m.
possible was done to try to help him. in that for in this way he did not suffer. lie who too have made the supreme sacrifice. Please accept my heartfelt sympathy for you in your great sorrow and loss. For a direct email link to the contributor of Harry Broun's Diary, please email Peter Porteous. Copyright © Peter Porteous, May, 1997.